According to a report by the Korea Times, a source citing Samsung's suppliers said the firm "has agreed with Apple to quadruple monthly shipments of its mobile AP chips to 20,000 sheets throughout this year from 5,000 last year." The report said this would result in half of Samsung's mobile Application Processor chip capacity being dedicated to Apple in 2011, making the iPhone maker a bigger consumer of Samsung's mobile chips than Samsung itself, which builds similar chips for its Galaxy S smartphones and Galaxy Tab mini-tablet. "Samsung aims to chalk up multiple effects through the sales," the translated report stated, citing the same Samsung supplier. "For one, it will be able to strengthen its non-memory business by shipping fast and low-power chips to Apple. Thats a very fine-tuned strategy." Samsung was also said to be building a new $3.6 billion chip fabrication plant in Austin Texas, "in an apparent scheme to ship more of its mobile processors to Apple," the report noted. The company currently builds APs like Apple's A4 in a factory near Seoul, in a an advanced 45nm facility capable of producing 40,000 sheets of the chips per month. The company's efforts to expand mobile chip production, with most of it going to Apple, is "also a major blow to local medium-sized tablet PC makers as Apple is more profitable and lucrative for Samsung," the source reported. Samsung will also be fabricating custom chips for Texas Instruments. The report erroneously claimed that Apple "stopped buying" APs from Samsung in 2008, and suggested the two companies had strained relations. Samsung has long built ARM-based processors that Apple uses in its iPhone, iPad and many recent iPods. 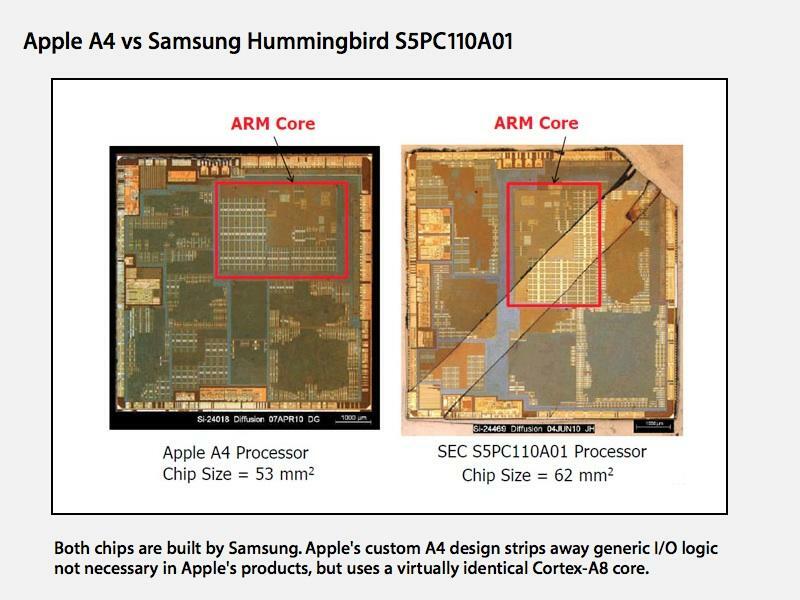 Prior to last year's introduction of its custom A4 design, Apple used off the shelf Samsung "System on a Chip" processors, which pair an ARM CPU core with dedicated mobile GPU cores and other components in a single part, also called an Application Processor. Starting in 2008, Apple began licensing its own rights to develop custom AP designs using intellectual property from ARM and Imagination Technologies. It then acquired Intrinsity, which gave Apple the technology to accelerate clock speeds from the 600HMz Samsung SoC in the iPhone 3GS to the gigahertz speed of its new A4 chip used in iPhone 4, iPad, and Apple TV. However, Apple continued to partner with Samsung to build the new chip, which is similar but not identical to Samsung's own "Hummingbird" AP, used in the firm's own Galaxy S, Galaxy Tab, and forthcoming Galaxy Player. While the two companies compete in smartphones, tablets, and media players, Apple is an important client for Samsung, not only in the fabrication of Apple's custom APs but also DRAM and NAND flash memory, LCD displays and other components. At the beginning of last year, Apple was already Samsung's second largest client after Sony and ahead of Dell, HP, Verizon and AT&T. Samsung is the world's largest producer of RAM and flat panel displays, and second largest chip producer behind Intel. Apple is the world's largest consumer of RAM, and is eating up an increasingly large share of mobile APs and displays as sales of iPhones and iPads accelerate.